also known as - Wild Damson, Bolas, Bullions. 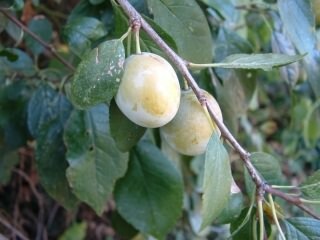 Small compact common fruiting shrub long cultivated for its edible fruit (plums), found over most of the U.K (rare in Scotland), South-East Europe, Northern and Central Asia. Hardy and disease resistant they grow in thickets, woods and hedges. Bush like shrubby habit sometimes developing into a small tree about 6m (15ft) high. Somewhat resembling the Blackthorn or Sloe, but is less thorny having straighter branches with brown bark and some older branches terminating in spines. 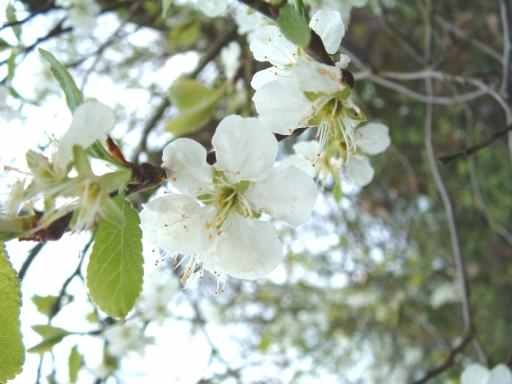 It has larger finely toothed leaves than the Blackthorn, downy underneath, alternate, on short stalks. White flowers again rather like those of the Blackthorn, but with larger broader petals, borne in less crowded clusters not on the naked branches appear just after the leaves have begun to unfold. All parts of the plant can be uses for various purposes - fruit, wood and bark. Globular fleshy fruit generally green and marked with a faint line, covered with a thin bluish bloom, about 2.5cm (1in) across, drooping not erect as the Sloe. An infusion of the flowers sweetened with sugar has been used as a mild purgative. In the U.K. the fruit is used to make "Bullace Wine", pies, puddings, jelly and jam (recipe below). 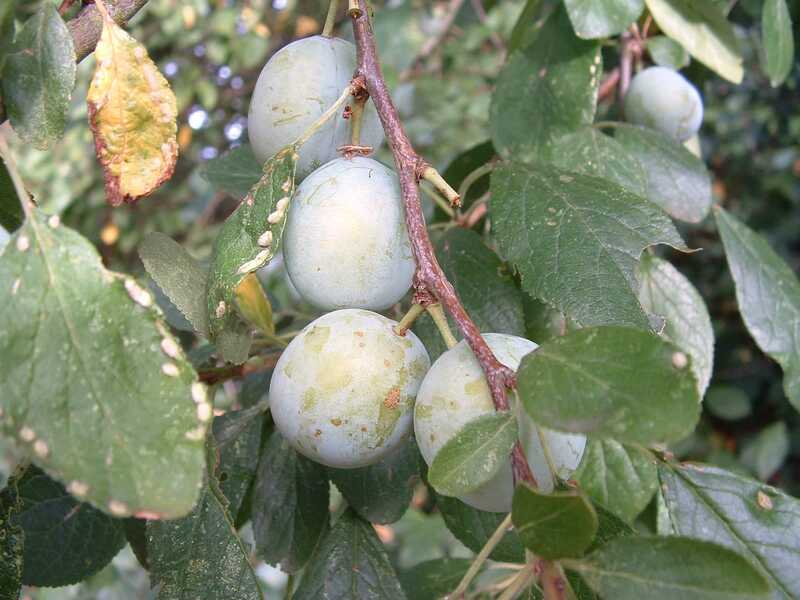 There are several varieties of the Bullace in cultivation, sometimes referred to as "Damsons", both Bullace and Damson originate from P. domestica, Bullace has a round fruit and is generally green with, Damson being more oval and purple in colouration. White Bullace - small round fruit, pale yellowish-white, mottled red on the sunny side. Flesh is firm and juicy, adhering to the stone, becoming sweetish when quite ripe in end of October and beginning of November. Often sold as "White Damsons". Essex Bullace - green fruit becoming yellowish as it ripens. Flesh is juicy and not so acid as the common Bullace. Fruit ripens end of October beginning of November. 2.5cm (1 inch) diameter, larger than the common White Bullace. 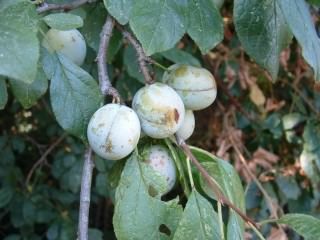 Royal Bullace - large fruit, 3cm (1.25in) in diameter, bright green, mottled red on the sunny side becoming yellowish-green, with a thin grey bloom on the surface. Flesh green, separating from the stone. Ripe in early October. A recipe for Bullace jam (makes approx. 2.2kg (5lb) of jam. Ingredients - 1.1kg (2.5lb) of fruit, 1.36kg (3lb) sugar, 420-550ml of water. Remove the stalks and wash the fruit and put into a large pan with the water. Stew slowly until the fruit is well broken down, add the sugar and stir over a low heat until the sugar is completely dissolved. Bring to the boil and boil rapidly, removing the stones as they rise to the surface, if you have one, use a stone basket clipped to the side of the pan, this allows the liquid to drip back into the pan. Continue boiling rapidly until the setting point is reached, testing for the set point after about 10min of boiling repeating every 10min as required. When ready skim and pour into dry warm jars and cover. If reusing jars and "click" lids, ensure they are thoroughly washed first and "scalded" just before use. Run jars and lids through a dishwasher set to a hot rinse or soak in boiling water first, fill the jar to the neck (or 5mm below the lid) and screw on the lid straight away, when the jam cools the "click" lid will activate providing the seal is intact. Be careful as the filled jars will be very hot! To test for setting point - place a small clean dry plate into a refrigerator for 10mins, to test remove the plate from the refrigerator and put a small amount of the jam onto the plate and leave back in the fridge for five mins. Test by pushing the edge of the jam to see if the surface wrinkles, if it does it is ready, if not continue boiling for another 5-10 mins and test again. Alternatively with a jam thermometer the setting point is reached at about 116-120 Deg Celsius but we have found the "wrinkle" test to be the easiest. As the setting point is reached the jam gradually turns a rich dark golden red colour.